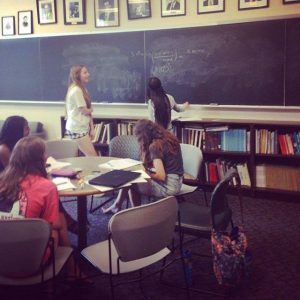 Over the summer, one group of campers comes to the University of North Carolina at Chapel Hill (UNC-CH) Mathematics Department every weekday for two weeks from 9:00am to 4:00pm to attend Girls Talk Math. 26 girls participated in 2016, 35 in 2017, and 39 in 2018. During camp, participants are divided into groups of four or five, and each group is assigned a problem set focused on a challenging mathematics topic outside the high school curriculum. Together with the problem set, campers are also given the name of a female mathematician or physicist who has worked on related problems. During the first day of activities and icebreakers, we give a 2-minute description to the campers about each of the available mathematics topics with some highlights of what is involved in each problem set (i.e. pen-and-paper math, coding, physical experiments, etc.). The groups are made based on their preferences and mathematics background. By the end of the two weeks, campers are expected to work together on their problem set and report their mathematics experiences in a blog post. Additionally, they write and record a podcast about the life and work of their assigned mathematicians after researching their story. Blog posts are available through the Girls Talk Math website, while podcasts are available on the website, on SoundCloud, and on iTunes. The 2018 Quantum Mechanics group performing an experiment to determine Planck’s constant. Most of the problem sets are pen and paper based, others include coding, while a few incorporate hands-on experiments. They are all written from an Inquiry Based Learning (IBL) approach. Campers are handed a problem set packet on the second day of camp that includes all the instructions and information they will need to work on their assigned topic. Each group has a volunteer team leader, typically an undergraduate or graduate student, that can guide them throughout their work, answering questions and checking their answers. The female mathematicians are chosen by camp organizers and in some cases work on topics only relatively connected to the problem sets. 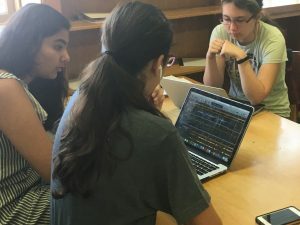 From the Chapel Hill camp alone, students have now produced podcasts focusing on 22 female mathematicians. Campers are invited to focus on whatever aspect of the mathematician’s life and career most interests them. Some of the female mathematicians our attendees have researched are Grace Hopper, Katherine Johnson, Maryam Mirzakhani, Moon Duchin, Fan Chung, and Jennifer Tour Chayes. The main goal of the podcasts is to highlight the many talented women doing mathematics and provide role models the girls could see themselves in. We purposefully choose a diverse group of women with respect to age, race, nationality, and mathematical interests as well as a blend of current and historical mathematicians. Our campers come from a variety of backgrounds, so we want the women they learn about to be diverse as well. Less than 50% of our campers are Caucasian. We have students enrolled in public, private, charter, and magnet schools as well as homeschooled students. For some of the students, English is not their first language. While we have a large representation of students whose parents have at least an undergraduate degree, we also have soon-to-be first generation college students. Additionally, the podcasts the campers make are available for other girls to listen to and discover the wide range of women doing advanced mathematics. Making the podcasts a core part of the curriculum also helps in our goal of reaching the girls who don’t see themselves as math people. A high schooler who is curious about math or knows the value in it but doesn’t enjoy math class is more likely to attend a math focused camp if they have the chance to participate in other activities. Several of our campers have indicated on their applications that they aren’t math people but know math is important. Some campers have even told us directly they don’t generally like math. While a significant part of the program involves grappling with difficult math concepts, this is not the only activity campers are expected to engage in. Our advertising clearly indicates the role of the problem sets in camp but also emphasizes the podcast creation. Many girls who are capable but lack confidence in their abilities are likely to be intimidated by a traditional academic math camp. 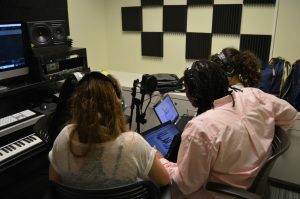 By incorporating and advertising the podcasts we are able to reach a broader range of students. 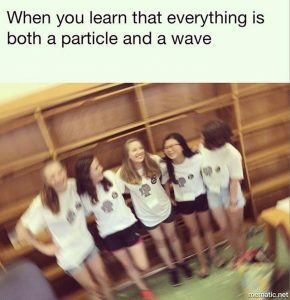 Camper-created meme of our Quantum Mechanics group. Recruiting campers who don’t see themselves as math people is one challenge, but changing their minds is another. We took an IBL approach to designing the camp curriculum because we believe it aligns well with the program goals and philosophy. Through active learning, campers take ownership of their work and learn to see mathematics as creative problem solving. Many high schoolers are taught an algorithmic version of math that understandably fails to get them excited. The IBL problem sets engage the campers in answering challenging questions through their own reasoning. The collaborative group work structure helped to create a sense of belonging to a small mathematical community. For girls who find themselves in math classrooms full of mostly boys, this provides a unique chance to connect with other girls interested in math. 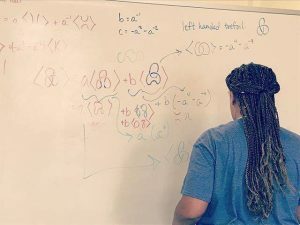 One of the campers who attended the 2017 camp wrote an article for her high school paper about her experience at Girls Talk Math which captures this community culture beautifully. She says that she came to camp despite not liking math and cites the relationships she built and people that she met at camp as the primary reasons she left the program with a different view of mathematics. We chose to develop an IBL curriculum because we believed it would be effective in increasing confidence and getting students excited about the material. (Visit http://sigmaa.maa.org/ibl/ for more information about IBL.) An average camp day includes two 1hr 15min time slots for group work. Each group indicates whether they will be working through the problem set or researching and planning their podcast. Team Leaders check in with each group to help them plan and prioritize, but campers choose how to spend their time, giving them ownership over their work. The problem sets are challenging, but everything the students need to know to complete them is provided in the packet. 30-minute interactive lectures on each of the problem set topics are presented throughout the two weeks so that campers can see what other groups are working on, but these are not prerequisites. Campers are encouraged to talk with each other to get through problems they are struggling with. Team Leaders regularly check in with each group to assure campers are not getting stuck and simply not speaking out. In our volunteer training we emphasize to the Team Leaders that their role is to ask probing questions and guide students through challenges rather than give them the solutions. In many of the podcasts, campers mention the problem sets and struggling through them. They talk about the process of going from being totally confused and a little overwhelmed to being able to make sense of things and how this made the idea of tackling new problems a little less scary. The girls’ reports of their experience support the idea that the IBL philosophy fits well into the framework of addressing the barriers girls face that prevent them from entering mathematics. The camp has evolved from the first run in 2016. In the last two years we have included a variety of activities that relate to our camp goals without necessarily being directly connected to the covered mathematics topics. 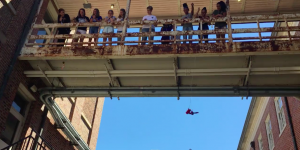 One of the highlights of the first day of camp is our Barbie Bungee Jump. Campers are divided into groups and each group is given a Barbie and a bag of rubber bands. They need to create a bungee cord for the Barbie to jump off of a 28 ft high walkway in the mathematics building. Students are allowed to practice on staircases around the building, but they only have one shot at the final jump. We then have an informal mini-tournament. Two teams at a time drop Barbie off the walkway; if she touches the ground, the group is eliminated. If both Barbies survive the jump, the team that gets her closer to the ground without touching wins the match. After the first round, all the winning teams compete in the final. The game is always a favorite of our attendees and volunteers. In 2017, we created a camp library full of books, comic books, activity books, and games that is at our campers’ disposal throughout the two weeks. Students can browse through the books during the camp breaks and check out the titles that most interest them. We have chosen books on a variety of topics: mathematics-focused titles, novels, nonfiction books reporting the stories of scientists from underrepresented minorities, and many more. Our goal is to give our campers free access to materials they wouldn’t otherwise see. We want to increase the visibility of scientists, activists, educators, and historical figures who have worked towards breaking barriers and achieved the unexpected. This year we have invited local professionals in the mathematical sciences for a Mentor Lunch. We organized the camp room so that each professional was assigned a table with a name tag. Campers were given short bios for the mentors in advance to decide who they were most interested in meeting; students were invited to move around and chat with as many mentors as they wished. Campers asked questions and all tables seemed to be having lively conversations for the entire duration of the event. Our mentors came from numerous professions; for example, we had a statistician for a government agency, a science librarian, a mathematics online curriculum developer, and a chemical engineer from a pharmaceutical company. Last fall we organized a follow-up event for the 2017 campers. 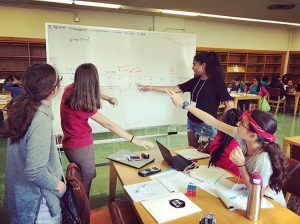 Thanks to the help of two UNC librarians, we organized a Women in Mathematics Wikipedia Edit-a-thon. 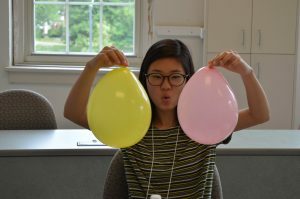 Campers returned to campus for one day in September and learned how to edit Wikipedia to update or create pages for the female mathematicians they had researched during camp. The event was a success, so we decided to include the edit-a-thon in the camp activities for 2018. The elements we added contribute to the culture of creativity, exploration, community, and empowerment that we hope to provide for our campers. We want the girls who come to camp to feel inspired to explore more mathematics and believe they are up to the challenge. By consciously choosing camp activities that support these goals and acknowledge the barriers and challenges young girls face, we believe we have created a program that is effective at reaching young people who might not otherwise have seen themselves as potential mathematicians. Girls Talk Math is expanding. 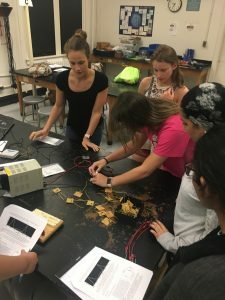 This summer a sister camp ran for the first time at the University of Maryland at College Park, thanks to Sarah Burnett and Cara Peters, camp directors and Ph.D. candidates at UMD. They used our curriculum and resources for activities, structure, etc., but recruited their own volunteers and campers, as well as secured their own funding. Balloon experiment from our Fluid Dynamics problem set. We have been contacted by other students and faculty at various Universities in the United States interested in learning more about our program and potentially starting their own Girls Talk Math camp. One of the main obstacles for a program such as this is having original curriculum to choose from and a structure that has already been setup. We are excited at the opportunity of helping anyone interested in expanding our program to other locations, offering support in planning, organizing, and maintaining the camp. For more information on how to start your own Girls Talk Math camp, visit our website. We are planning to publish online with open access on GitHub and our website the curriculum that has been developed for our program. We will periodically upload more problem sets for people to download, use, and make their own. We are hoping that not only folks wanting to start their own camp will take advantage of the publication, but also high school teachers, tutors, educators, middle and high school students, math circles, math clubs, etc. We will continue improving our existing problem sets based on the feedback we receive from campers and general users. We would love for anyone who is interested in developing a new curriculum topic to contact us at girlstalkmath@unc.edu. The more topics are available, the more likely it is to capture the interest of a variety of students. As the program expands, we hope to expand our community, connecting with the many mathematicians and educators who are passionate about making Mathematics inclusive. Changing the culture surrounding math is no small task, but with our combined resources and efforts we can create more opportunities for young girls. This entry was posted in culture, mathematics experiences, mentoring, minorities in math, participation, social media, women in math. Bookmark the permalink.